Drew Cason | Akleg Aug 9, 2018. Wednesday – Alaska Governor Bill Walker signed legislation sponsored by Representative John Lincoln (D-Kotzebue) to give Alaska school districts more time and flexibility to provide the local match required under the School Construction Grant Program. House Bill 135 loosens the existing three-year deadline, which can now be extended by the Commissioner of the Department of Education and Early Development to a maximum of seven years; provided there is good cause, the extension doesn’t jeopardize successful completion of the project, and the extension won’t increase state funding of the project cost. 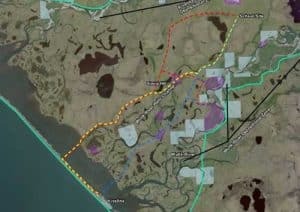 The legislation is of direct concern for District 40 and the new school planned for Kivalina. That project is taking longer to put together because of the additional need for almost eight miles of new road to the school site. HB 135 will also address other existing projects that need more time in the Yukon Flats School District, Yupiit School District, and the Kenai Peninsula Borough School District. House Bill 135 enjoyed overwhelming support in the Legislature, passing unanimously through both the Alaska House and Alaska Senate. Alaska Governor Bill Walker signed HB 135 today during a ceremony in Kotzebue.